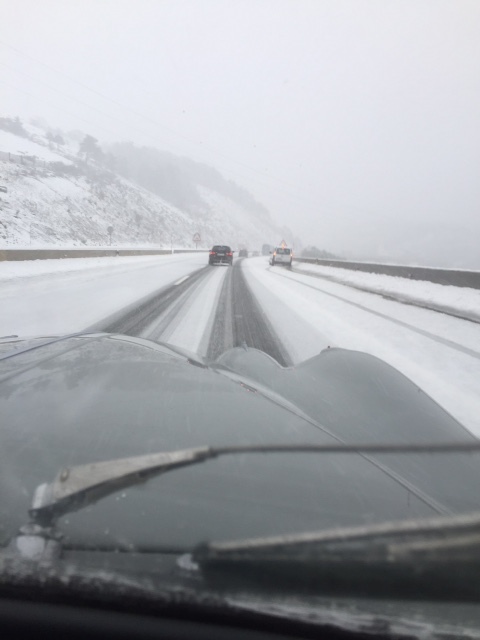 Michael and Wendy Birtwistle sent me this account of a recent journey Michael took between Mojacar and Manchester-as you can see it certainly did not go to plan…. The ferry was booked for Thursday (10th March) so being on my own I thought I would take my time and left on the Tuesday deciding to stop in the Parador at Cuenca. A superb drive up with little traffic and the car running sweetly. Beautiful place to stop, very historic and pretty. 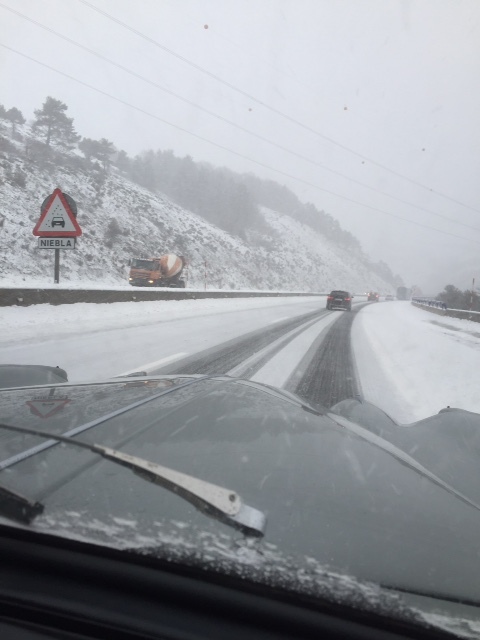 Next overnight was Burgos and again lovely run, mostly light traffic and car was perfect…. lovely hotel and evening meal. Then awakening on the Thursday morning to terrible sleety, snowy weather, so up and off! I was certainly glad the heater worked as the car has been in Mojacar for more than a year and in that time it’s never been needed. 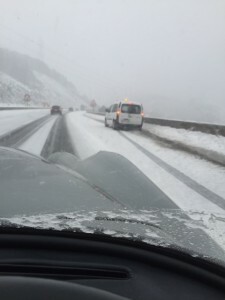 I progressed on towards Santander the weather steadily got worse and worse (see pictures!!) I was in convoy with a British registered Mazda MX 5 for a long stretch, at one point he lost control of the vehicle, luckily not hitting anything hard. We met up at the port afterwards both relieved to have got through without incident or getting stuck. The authorities were very professional with snow ploughs and gritters a plenty. Now, as we all know salt and grit do not go well with an old classic car. I was not well pleased, but luckily as I neared Santander the weather changed to VERY heavy clean rain so much of the salt was washed away. Arrived at the port relived to board the ferry. The crossing was ok., if a bit rough but I was just glad to be on my way to Portsmouth (docking at 14:45) I thought the journey was done apart from the last leg Portsmouth to Manchester, 250 miles mostly motorway a five-hour trip with good stops. Off the boat, through customs/passport control and away, full of fuel looking forward to a pizza with Wendy at our local Italian Resturante…. How wrong can you be!!!! Approaching M40/M42 junction a truck loaded with animal feedstuffs hit the central barriers and distributed its contents across all the carriageways! So the 5-hour journey turned into 12! With a 7-hour closure of the motorway and no escape…. So it was an adventure I don’t wish to repeat in a hurry. We returned to Mojacar 3 weeks later via the same route in a 1990 XJS without any sort of delay, problems, or bad weather.